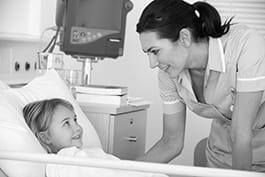 Hospital nurses provide bedside nursing and direct care to patients in the hospital and consult with physicians and other members in the health care team about an effective care plan. Monitor the medical condition of the patient, including diet and physical activities. Observe and report change in conduct, conditions, and physical functions of the patient. Create and maintain records of patients. Provide preventive, curative and palliative nursing treatment and therapy. Assist medical doctors in their work during treatments of patients e.g. by performing basic (medical) procedures such as taking blood pressure and applying and changing dressings. Collect specimens such as urine, faeces or sputum. Assist patients in activities such as walking, exercising and getting in and out of bed. Prepare patients for operations and assist with examinations and treatments. Check equipment, supplies and stocks. Arrange information, advice and instruction for patient treatment and care after they leave hospital and educate also the family about the details.